Hey, friends! I have been on an organizational BINGE around here. Cleaning out closets, purging, donating, sorting, organizing and everything in between. I always get bit by the "organization bug" right after Christmas when I start putting decorations and kids gifts and everything else away and this year it bit HARD. A while ago I found these containers at Homegoods and loved the size and how they sealed and opened easily. We had all kinds of crackers, snacks, etc. in all kinds of boxes and bags and it was hard to keep organized and hard to see how much of each item was left. This way I can see exactly what I have with just a glance. There's a little handle that you flip up to unseal it and remove the lid and then when you put the lid back on you just put the handle back down and it seals. I LOVE these baskets because they look like rattan but since they're resin I can wipe them down if something spills. Perfect for the kitchen. I keep lunch box snacks in them, canned goods, etc. I keep most of my baking supplies in glass jars I picked up at Wal-Mart and I've had them for years and still love them. I didn't take a great picture of them, but there are three big baskets at the top where I keep papaer plates, cups, napkins, serving pieces, etc. On the floor I keep a basket for our YumBoxes and my lunch box, the dog food, some extra cereal (told you we love cereal! ), trash bags, etc. It's kind of hard to see, but we also keep a broom and dust pan, the swiffer and the Bona floor cleaner mop in here as well. It works for us. Our "junk drawer" in the laundry room was extra junky and so I got an organizer for that drawer as well. 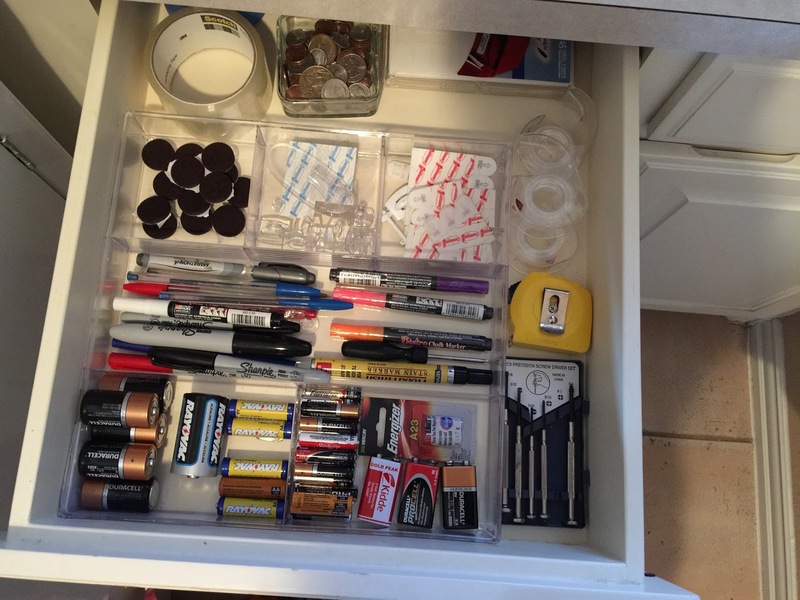 All the typical junk drawer stuff is now neat and tidy. Amen. The other area that got a bit of an overhaul was our office "craft closet". I've talked several times about how I like to use containers I had on hand to store supplies - and while they were absolutely fine - as my kids have gotten bigger and more independent they were helping themselves to a lot of the supplies and when we had a glass container get dropped and shattered I decided to rethink some of my storage in this space. I pared things down and then used dollar store containers (the blue bins), stack and carry containers and a few others different sizes to get everything organized. The blue bins on the top have party supplies (balloons, cellophane bags, etc) and a little stash of bday gifts for the kids friends (those Pokemon books!). The next shelf has glue and paint, a stack of scrapbook paper, the white container has foam sheets and then miscellaneous supplies are in these containers). I liked how they weren't too big (so I could put a single type of item in them and not feel like I was wasting space), but also that I could take single containers out (unlike a drawer) and bring them to wherever we needed. See??? Thin, but still big enough to hold the glue gun and extra glue sticks without a ton of wasted space. Love! My favorite containers are these stack and carry ones. It's great for getting supplies out and bringing them to the table and keeping everything neat and tidy. The top of this container has the kids beads and the bottom has their paint. When we're using the beads I can remove that section and leave the paint or I could put the lid on the paint section and carry that to the table. Easy! ... and smaller versions hold little supplies that the kids use when they do crafts. The left side of the closet looks similar to how it looked before... spray paint, acrylic paints, note cards and stationary, wrapping supplies, etc. The right side has filing supplies, a little stash of things I'm going to use for my classroom next year and the printer. On the very bottom shelf are mailing supplies and then on the floor we have a file box for mail and records and then the cardboard box holds gift bags. Here's the best part... I happened to find all of these containers when I popped into a local discount store to grab posterboard for an assignment Mason had to do for class. I paid $6.50 for the large stack and carries and under $3 for all the other containers. It was a total steal. If you have a Big Lots near you I STRONGLY suggest that you check them out!!! The desk drawers in my office got a little clean out as well. I have no shame in admitting that this one was full of papers and other miscellaneous junk that didn't need to be in there and now it holds a couple of pairs of scissors, a lighter, notebooks and the little pad where I keep up with blog posts for the upcoming weeks. 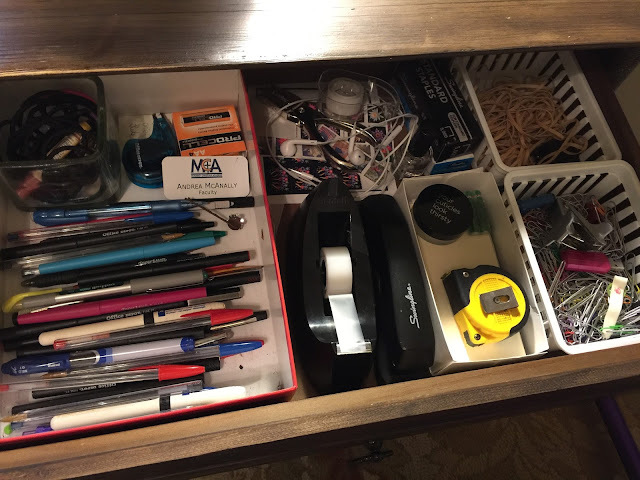 The other drawer is just basic office type supplies and stamps. The last area that I'm going to show you is something that I've never shown before and is actually the answer to one of the most frequently asked questions I receive... where on EARTH do you store all your holiday decorations??? The entire thing has a floor and all of my holiday decor is stored in tubs along one side arranged by season. (yes... I'm aware of how ridiculous that sounds. hahaha) At the very back is where we keep the Christmas trees. Those two blue bins in the middle are "memory bins" where I throw things that I want to keep for the kids as they grow up... teeny baby onesies, school artwork, the tassels from their kindergarten graduations, etc. Mason and G are currently sharing one, but at some point I'll pick up a third and that will be the one bin I keep for each of them (or at least that's the plan). This is what my parents did for me and I love sharing the things from my bin (like my troll doll and sticker book) with my kids. Right now the school papers and art are just stacked inside the boxes... I label them with their name, school year and date and only keep their (or my!) favorite art, their creative writing, etc. The other side of the attic has the same amount of storage and that's where we have the normal random attic stuff (a djembe drum, all the Thomas the Train stuff I plan on keeping for grandkids (aaaah!!! ), etc.). We also have a full third story attic that's a pull down, but we don't have any plans to use that. This attic has been SO NICE because it's more like a storage room than an attic... I can go in there, open up boxes and pull things out as needed rather than having to haul all the boxes down. When I sort through their school work at the end of the day it's a breeze to just walk in here and pop whatever we're keeping in the box. It's been wonderful! So... there you have it!!! Is it just me or does having a freshly organized space make you feel like you can conquer the world? ;) Do you have the urge to go organize #allthethings??? I'd love to hear your organizational tips and tricks OR what you have a hard time keeping organized in the comments. I have been on the same organizing/ cleaning out kick~ It feels great!! 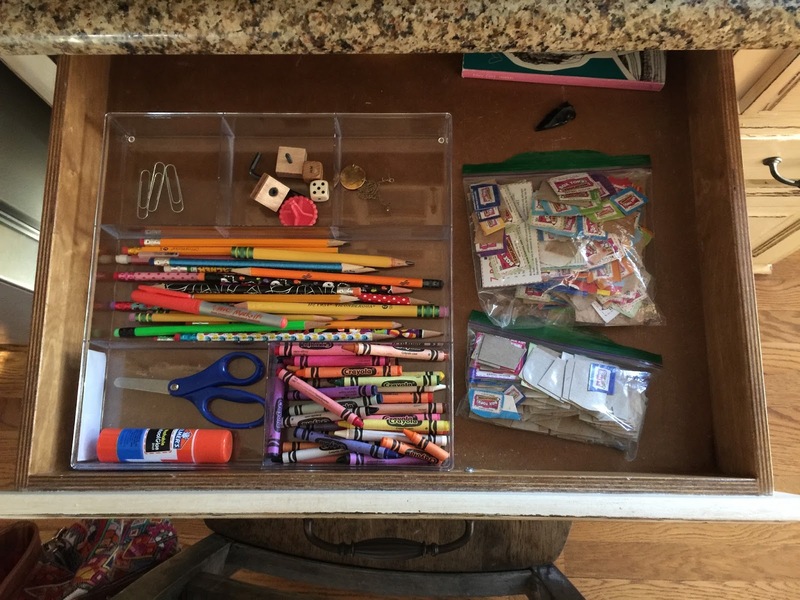 Next on my list is cleaning out each of my kids "things to keep" bins! They are over flowing! No better feeling!!! Love it! Have fun, girl! Hahaha - Love you, friend!!! You can send them over here to craft anytime!!! Girl! You know I'm game :) Make some guacamole and we'll call it a day! I'm so inspired!!!!!! I went to get those kitchen junk drawers into shape right now! Ooooh! I'll have to check them out! Thanks for the tip! Oh you just made my type-A heart so happy! The craft closet immediately reminded me of the boxes Mama Bear made the cubs in The Berenstain Bears Messy Room. So fun! Wow! Girl, these look amazing!!! Your attic space is awesome!! Love! I agree. The new year is for organizing all the things! We love our home but the one thing we would change would be a larger pantry. As a family of five, soon to be six (as soon as we can get our new seat Peanut home from China) pull out cabinet pantry is just not enough. In love with your organized pantry space! The pantry in our old house was pretty small as well - I feel your pain! I am so impressed you got me in the mood to go buy some storage containers and get busy! Love that attic space as well. I noticed the pantry in your InstaStory this weekend and was hoping you would do a post about it! Also, thanks for being honest about your foods- we're all just hard working Moms that shouldn't feel bad about feeding our kids fruit snacks and macaroni! I have the Original Scrapbox Workbox for my craft area and I always say that I wish I had one for every area of my life that needed organizing- ha! I have the pull down attic and it's such a PAIN! I wish I had the walk-in like you. Posts like these are my FAVORITE!!! Right?!?! I didn't know how big of a difference it was going to make - but it's been amazing! Ok. First of all, is this genetic or is there some magic teacher class I need to take? Second...I know I'd have to pay your plane ticket to Seattle, but could you bring a cute kid or two to keep me entertained while you (errrr...we ?? 😳) do my house? I'm inspired. Gutting the pantry. Hahaha - so funny!!! :) I think it's genetic! We have twin pantries!! But yours looks WAYYYYYY better than mine right now ;)! EWWWWWWWWWWWW!!!! I haven't had that issue, but will FOR SURE be on the lookout! Thanks for the heads up! Great job organizing! Have you seen the wrapping paper rack they have at the Container Store? We have one and I LOVE it! Here is the link! Oh my gosh! I die over all the space you have! Amazing! 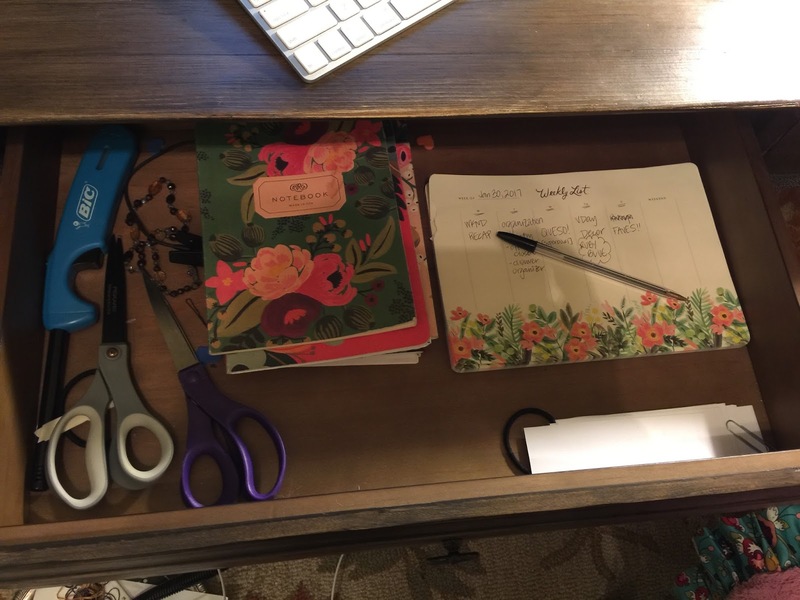 I just cleaned out some closets yesterday but this post has me wanting to overhaul my life! Thanks for sharing! No shame in fruit snacks and pasta roni! Great organizing in all your spaces. Very inspiring! Love this!! And I'm totally jealous of all your space. I so envy your attic. My decorations are in the garage and a pain to get to. And I think I need to make a trip to the nearest Big lots! It's a total blessing! And YES to Big Lots! I had no clue!!! Oh wow! Everything looks so nice and tidy! Congratulations! I know that feels good to have everything in order! If you have a prayer list, will you please add my friend Megan Chlopek? 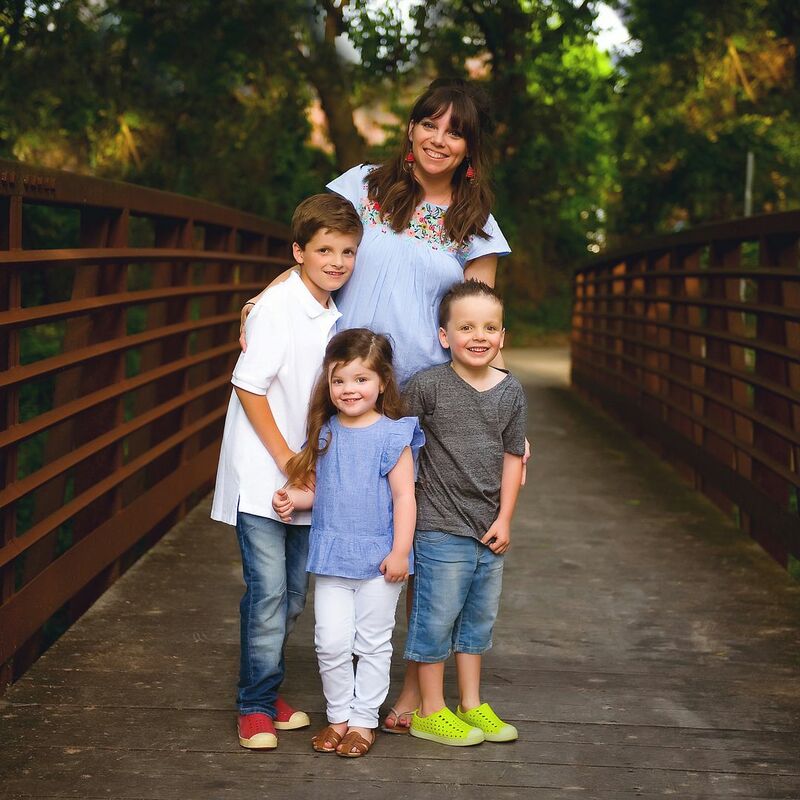 She was 26 weeks pregnant with twin babies when she went into cardiac arrest last week. They delivered the twins at 26 weeks. Megan has been on a ventilator ever since, fighting for her life. She is not doing well. Last night, they lost the girl twin, Vaila. The boy, Leif, is not doing well either. They also have an almost-2 year old son. I am broken for her and cannot do anything except ask everyone I know to pray. Oh my gosh! YES! Of course I will! Does the family have a Caring Bridge or GoFundMe page I can check out for specific prayer requests and/or a way to donate? I am so sorry that this is happening to her and her family. They don't yet. They are just in survival mode right now. I'm sure that will all come in time. WOW you are so organized! You definitely have that amazing teacher blood! Yay!!! This post gives me all the happy feels!!! Lol. I am just about to start a kitchen reno (hallelujah!!!!!) and I can't wait for it to be done so I can reorganize!!! Thanks for your great ideas! Heading to Big Lots ASAP! Oh Wow! Can I be you when I grow up? I so need to get organised and you are now my inspiration. I just need to find the time..
Great post I am saving for when I finally get a moment! Thanks! What size did you get or works best in those plastic amazon containers? They seal well enough, food doesn't go stale? I am highly interested. You just have no idea how happy this post makes me! Hahah!! I LOVE organization!! Totally jealous of that attic! I have a similar pantry and added big lazy susans in the corners which really helped me out.